Posted on 4/9/2019, 9:17 am, by rackycoo, under General Projects. I don’t care for the taste of mushrooms, but I do love the way they look, especially the red ones with white polka dots. 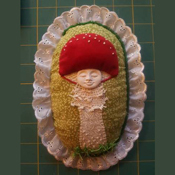 There are some really great mushroom projects to be found on Craftster, and here are a few of my favorites. 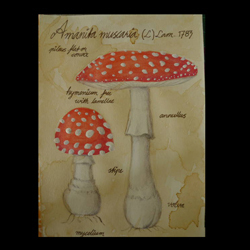 mrraawwr painted this beautiful water color mushroom postcard for a lucky swap partner. It looks just like an antique botanical print. Here’s a happy little ‘shroom with a vibrant red top. What a serene expression on that face! craftylittlemonkey made this lovely mixed media hanging. 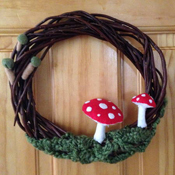 This wreath by calixita features a couple of kinds of mushrooms. What a great accent for your front door. 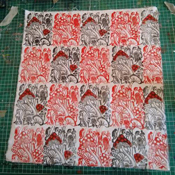 edelC created mushroom print fabric, using carved linoleum. I can think of all sorts of fun projects you could make with this! Dali and mushrooms: who could ask for more? maxxev sculpted this wonderful homage to Dali out of polymer clay. 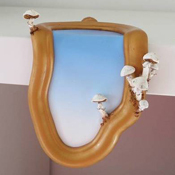 Click on the Craftster tag “mushroom” to see even more of your favorite fungus! Mushrooms are delicious! Not those red ones though, they can kill ya. Just for looking at, super cute!